This page is part of the Lectionary project of the FaithFutures Foundation. From Mount Hor they set out by the way to the Red Sea, to go around the land of Edom; but the people became impatient on the way. The people spoke against God and against Moses, "Why have you brought us up out of Egypt to die in the wilderness? For there is no food and no water, and we detest this miserable food." Then the LORD sent poisonous serpents [Hebrew: seraphim] among the people, and they bit the people, so that many Israelites died. The people came to Moses and said, "We have sinned by speaking against the LORD and against you; pray to the LORD to take away the serpents from us." So Moses prayed for the people. And the LORD said to Moses, "Make a poisonous serpent, and set it on a pole; and everyone who is bitten shall look at it and live." So Moses made a serpent of bronze, and put it upon a pole; and whenever a serpent bit someone, that person would look at the serpent of bronze and live. This is an extremely brief story, but it raises many questions about the character of God and the nature of the tradition now preserved in the biblical texts. Since the accounts of the exodus and wilderness wanderings are now known to be legends recounted to describe Israel's origins, rather than memories of events that actually happened, we are probably right to think that the story of God instructing Moses to fashion a bronze serpent (when there just happened to be such an object displayed on the Temple wall) is a projection back into the past for the sake of justifying a practice from the time of the later tradition. One finds biblical examples of such belief in the five golden mice fashioned by the Philistines when these creatures overran their land (1 Sam. 6:5 LXX) and in the bitter water cured by bitter wood and salt (Exod. 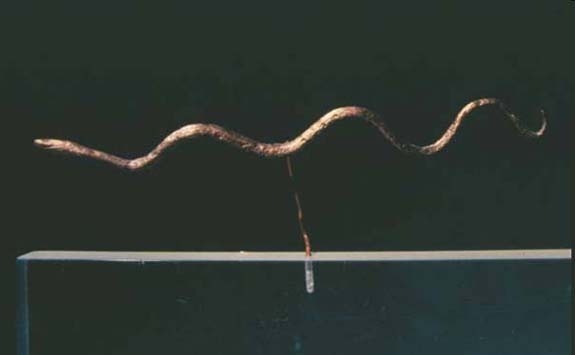 15:25; 2 Kings 2:21).The homeopathic use of snakes is a distinctive feature of ancient Egypt. A serpent-shaped amulet was worn by the living to repel serpents and also by the dead -- often mummies -- toward off attacks by serpents and other reptiles in the netherworld. Thus ... the belief prevailed in Egypt that images of serpents would repel serpents as well as heal wounds caused by them. This time the guards threw Asclepius into a dark and damp infested hole. The old man felt helpless and wondered if he would ever again see his beloved family or feel the sun or breathe the fresh air. He watched as a snake entered his cell through a small hole in the wall. The snake had its freedom, yet it imposed itself on him in his miserable quarters. He was angry and frustrated. He grabbed his walking stick and struck the snake again and again until it was dead and its pieces were scattered on the floor. "Why did I do that?" he asked himself, for it was unlike him to harm another creature. "I'll die in this cell just like that snake." As he sat, sadly concerned about his sanity, he noticed a small pointed head with a darting tongue as it poked out from the hole where the snake had entered. A second snake slithered through the hole and into Asclepius' cell. This snake looked like the last one, but it carried an herb in its mouth. Asclepius watched as the snake spread the herb on what remained of its brother. More amazing still, the parts of the first snake began to heal and grow together again. After a few minutes, the first snake was whole and healthy again and both snakes fled back through the hole, but not before the second snake dropped what remained of the healing herb. Asclepius called the guards to take him to Glaucus and, as he spread the herb upon his body, not only did the prince return to life, but his illness was cured as well. King Minos was overjoyed and Asclepius collected a large supply of the magic herb before he returned home. In the Hebrew text, the deadly agents unleashed by God on the complaining Israelites were not so much snakes as avenging angels. As cherub bearing a flaming sword had driven Adam and Eve from Eden, so fiery seraphs now threatened to destroy the disobedient population. The winged serpents that guarded the holy places in Egyptian hieroglyphs, are now found in the biblical texts as expressions (and guardians) of the terrifying holiness of Yahweh. Presumably the bronze serpent from the Jerusalem temple was a traditional cult object, just as Isaiah 6 reports the prophet seeing such frightening winged creatures in his vision of Yahweh. Given the traditional Egyptian cultural and political dominance of Palestine, it would remarkable if the Jerusalem temple had not displayed such images -- even if, like the golden bull calf on which Baal (the storm god) was traditionally mounted, they were reinterpreted as Yahwistic images. Winged uraei dating from the Canaanite period have been found, proving that the image of the winged serpent was well known in ancient Israel. The seraphs of Isaiah's vision (Isa. 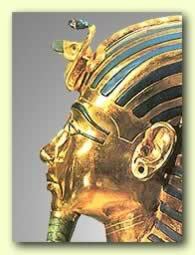 6) are best understood in the light of the Egyptian symbol of the winged uraeus: As the uraeus is always standing, so the seraphs; as the four wings of the uraeus represent the four corners of the land, so the winged seraphs chant, "His presence fills all the earth" (Isa. 6:3); as the Egyptian uraeus belches consuming fire on the pharaoh's enemies, so the seraphs' repetition of the trisagion ("Holy, holy, holy") shakes the Temple, filling it with smoke (Isa. 6:4); as the winged uraeus can be endowed with hands, legs, and a human face, so the seraphs of Isaiah's vision (Isa. 6:2). It is important to note that a seraph becomes the agent of healing and purification for Isaiah (Isa. 6:5-7), thereby providing a link between his snake-seraph of Isaiah and the therapeutic snake-seraph of Moses. Archaeology has turned up other examples of sacred snakes and winged serpents, at least some of which may be connected to the ancient sea-dragon that eventually fed into the traditional images of Satan as "that ancient serpent" (Rev 12:9). Like the crocodile (immortalized in myth as the ancient sea-dragon defeated by the creator god in a cosmic conflict at the beginning of time), snakes seem to have fascinated the peoples of antiquity. Snakes inhabited the nether world, yet did not seem to succumb to death. They moved -- slid -- between the world of humankind and the world of the dead, and even seemed to have mastered the art of immortality as they shed their old skins and emerged renewed for another cycle of life. 350 Jesus To Nicodemus - (1) John 3:11-21. This page was last modified on 12 March 2012, at 12:54.